If there's anything I'm most jealous about from my beauty blogging friends in the US/UK, it's their long list of monthly beauty boxes to choose from. Heck, when Michelle Phan launched her MyGlam's GlamBag subscription service, I wanted to apply for a Visa and just live in the US. Of course, that's under the premise that I may afford to subscribe to the many options of beauty boxes because who wouldn't want a surprise gift every month?? Finally, my lone days of sana may ganyan rin sa Pilipinas days are over. 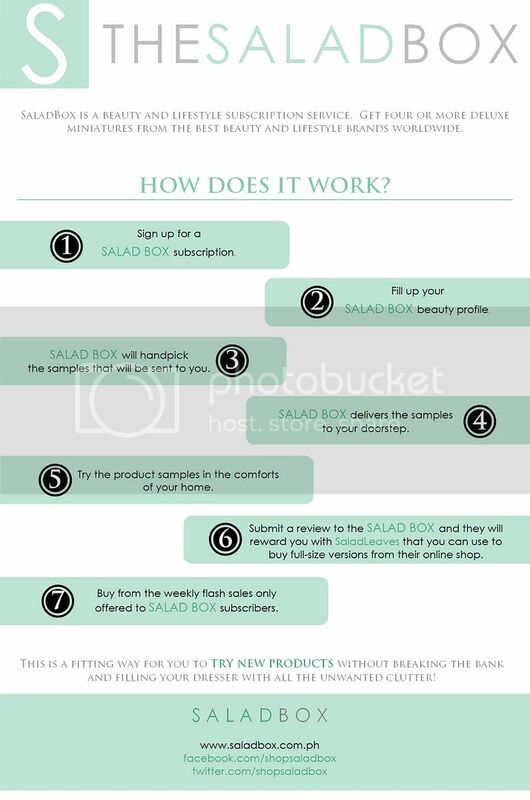 Finally, I don't have to wish upon the bright big star for a beauty box in the Philippines because TODAY, yes, today, SaladBox is launching their service! Visit their website now to sign up for their monthly subscriptions! For just P500 (approx $12) a month, you get to receive 4 products from local and international brands--specially selected by SaladBox team! :) For more infor, go to SaladBox.com.ph or view this infographic below. For just P500 per month, a subscriber will receive a box filled with four or more beauty and lifestyle product samples. The SaladBox team greatly values the money their subscribers spend so these products will have a value of more than PhP700.00. SaladBox is currently in partnership with a lot of beauty and lifestyle brands, both local and international, up-and-coming and timeless classics. To show our appreciation towards our subscribers, SaladBox will also host a weekly flash sale—these deals won’t be seen in any other group buying website in the country—wherein only the subscribers can take advantage of the awesome discounts that SaladBox negotiated from their partner merchants. First deal in line is from LayBare Waxing Salon. Also, SaladBox values camaraderie so they will give a subscriber equivalent SaladLeaves (reward points) for each successful friend referral. They also value a subscriber’s opinion so each product review will be rewarded with equivalent SaladLeaves. These SaladLeaves can be used to buy full-size products from their website shop and from the flash sales. And since subscriptions come in first-come, first-served basis, SaladBox will start accepting reservations for subscription slots starting September 8, 2012, 8:00PM Manila Time. They will send you a link to their subscription application form once it’s your turn to subscribe. SaladBox is a fun way to try out new products without breaking the bank and filling up your dresser with all the unwanted clutter. And with a SaladBox arriving at your doorstep, it’s going to be like Christmas every month! I'm definitely signing up! How about you? I'm definitely signing up! :D I've been so envious of those in the US/UK for having monthly beauty boxes. It's time that we have one here as well. Yay!